Mint (புதினா) leaves have a distinctive aroma and unique taste. Mint is rich in anti-oxidants, dietary fiber, vitamins A, C, E and B complex, essential oils, and minerals such as iron, calcium and potassium. Traditionally mint leaves are used for preparing marinades, chutneys, salads, and coolers; and also as flavoring agent. 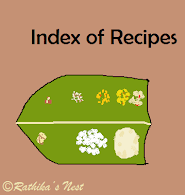 I have already shared with you the recipe of mint chutney, which can be served with idly or dosa. My grandmother used to make a spicier ‘thuvayal’ with mint leaves and it makes an excellent combination with curd rice, uppuma and kichadi. Let’s proceed with the recipe. * Usually one bunch of mint leaves would be equivalent to this volume. Heat oil in a kadai, add red chilies and fry till they turn darker in color. Add urad dhal and Bengal gram dhal, and fry till the dhals turn golden brown in color. Now add the mint leaves and sauté for 1-2 minutes. Remove from fire and allow the ingredients to cool. Grind fried ingredients, tamarind and salt with required water into a thick fine paste. Serve with curd rice, kichadi or uppuma. You may refrigerate the thuvayal and use it for a few days.